The Sleeping Beauty won’t get her kiss to awake her this year I’m afraid. Since the cleaning contractors have made no move since my last post I have reluctantly decided that I must pull my advertising and cancel my Christmas Season. It’s only eight weeks to Christmas and I can hardly feel confident that I will be ready to open. The Christmas Season is the one where pleople do plan in advance and book early, and it would be awful to have to send masses of texts and emails cancelling bookings. Already I have had grandmas ringing to book for the Boxing Day opening. 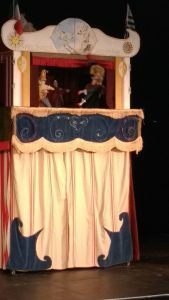 Boxing Day at the Puppet Theatre has become a tradition with some families. Maybe I’ll give it another week – but I am getting panicky now. 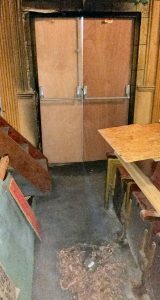 You may remember that the insurance loss adjuster emailed that the theatre cleaning company wanted to make an appointment to do a second survey, this time in the company of a scaffolding contractor. They asked me to supply information about local scaffolders. I sent them email addresses and phone numbers of two local firms. Eleven days later, when queried by the loss adjuster, they said they had left messages with both firms, neither of whom had got back to them? I contacted one of the contractors who is adamant that he had no call or message left. So we haven’t even got a date fixed for them to re-survey the building. They originally surveyed and submitted their quote in early August, yet still nothing decided and no work started, nearly three months on, so perhaps you can see why I am pessimistic about Christmas. Still I’ve got my health, and the weather’s quite pleasant, and I’ve done a couple of children’s parties, and I’m off to London for a day’s meet with Punch chums, so things could be so much worse. Posted on 11th October 2017 11th October 2017 Leave a comment on Some progress but now back to square one. Skipton in Yorkshire is but a few miles from where I spent my young childhood, a little village situated between Bingley and Keighley, on the edge of Ilkley Moor called East Morton. 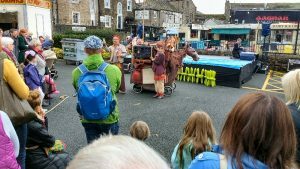 Skipton has become famous over the past decade for its bi-annual International Puppet Festival. 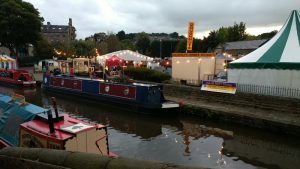 It is a weekend of spectacular novelty and set in the most picturesque market town you can imagine. It was this weekend and I stole a couple of days to get away from the depressive frustration of my fire-and-smoke-disabled theatre. 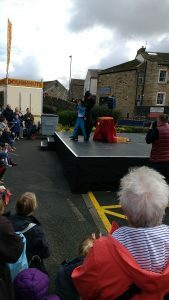 Despite dire warnings of rain for Saturday and wind and rain for Sunday it was a lovely weekend both for the journeys to and fro, and the shows themselves. 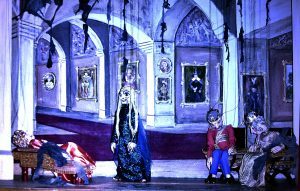 All of the theatre shows in various venues throughout the town were fully booked up in advance, but this didn’t matter since there are so many free shows. 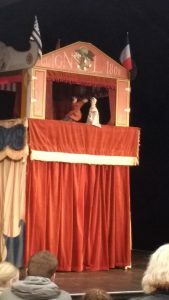 There are walkabout shows and happenings on the shopping streets, but the main free shows are centered on area on the canal bank where there are tents and pop-up puppets of every description. I thoroughly enjoyed myself.